Before providing an overview on the availability of Portland marijuana trimming jobs, it helps to familiarize yourself with the process of pruning and trimming marijuana plants, so you can search for jobs with a general knowledge of what the position entails. Two of the most essential processes of preparing marijuana flower for sale are pruning and trimming the plants. Since Portland has become an apex of the booming marijuana business, individuals are searching for any opportunity available to contribute to the success of the industry. Trimming is one of the more entry level marijuana jobs available in the Portland marijuana dispensary jobs market, but the future financial reward for speedy, detail oriented workers who know exactly what parts of the plant to save and spare, can be excellent. Pruning is essentially the manual upkeep of your plant’s growth. It’s a process that not every grower partakes, but can be a useful tool in protecting your plants from disease or parasite. It also allows for the plant to experience maximum growth and yield. Habitually clipping larger fan leaves, or leaves that are discolored or dying will help to provide more sun to the internal leaves and branches, and will prevent the plant from getting sick or dying from disease. For the most part, pruning is a consistent, measured process. This means that you should definitely not over trim. Over trimming will result in a plant’s inability to grow and produce healthy, optimal flowers. As the plant grows larger with multiple branches and stems, some growers use “topping”, which is the process of cutting off the top of the plant and the ends of its branches. This allows for the plant to shoot two new stems from the cut, which over time, helps to make a bushier plant. Growers do this in hopes of achieving a greater yield. There are many individual methods for marijuana pruning, but it’s important to have a plan and an understanding of why you’re pruning before executing. Pruning is part of the process of cultivation and is carried out most often by growers. Smaller growing operations and large scale farms alike may hire for help with plant maintenance, depending on their staff and needs. Acquiring a job as a grower’s assistant or helper often requires some years of experience working directly with marijuana and cannabis products, or at very least a background in horticulture, or some education from a marijuana training organization or certifying board. Winning a job as a grower’s assistant is a great step toward becoming a lead grower in the future. Working for a master grower will provide invaluable knowledge that you can take with you when you become in change of cultivation and are trying to yield the best crop. Master growers have years of experience with failures and successes. Over time, they are able to figure out which methods work best for them through trial and error, which is truly the best way to learn! Trimming is basically the process of preparing marijuana buds for distribution. Though there are multiple uses for the whole marijuana plant, the flower that is used for smoking most often doesn’t contain any leaves, as they have vastly lower concentrations of THC than the buds. Additionally, loosely trimmed or untrimmed flowers produce a much harsher smoke. From a sales perspective, trimming allows for the highest concentration of THC for the lowest weight. When visiting most dispensaries in Portland, you can expect to see very well trimmed buds of any flower you buy. This is something medical and recreational cannabis users have come to assume, making trimming an important job in the competitive marijuana industry. The specific steps detailing how to trim will vary. Some trimmers distinguish between two different methods known as “wet” and “dry” trimming. Wet trimming, the most popular method, is the process of trimming soon after harvesting the plant. Many consider wet trimming to be the easier method with a more aesthetically pleasing outcome. 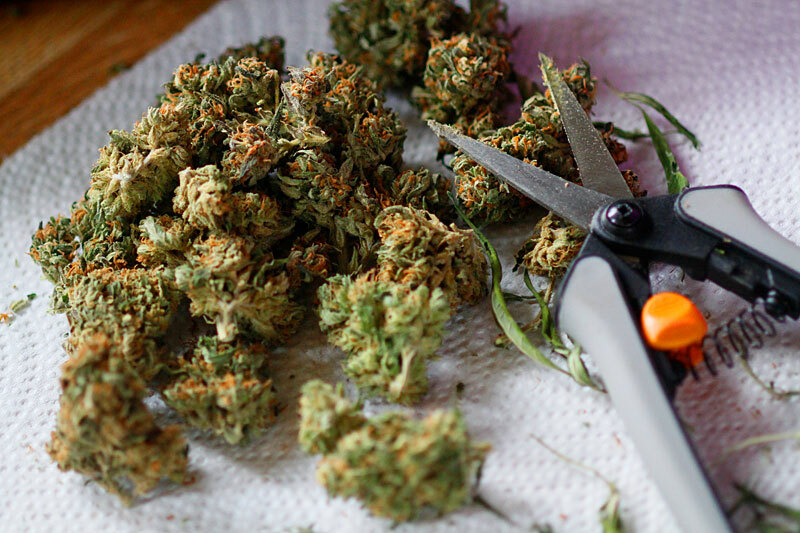 Wet trimming involves preliminarily removing fan leaves and then using a sharp pair of scissors to remove the small “sugar leaves” which contain lower concentrations of THC. When wet trimming, the buds are extremely sticky, but the leaves are easier to find and snip. Dry trimming, by contrast, allows for the buds to be cured before snipping the leaves off, increasing drying time. Dry trimming is ostensibly more difficult as the leaves are harder to individually access. In order to successfully dry trim, it requires a very deft hand. Though marijuana buds are viewed in popular culture as the most important part of a marijuana plant, the trimmings are also a valuable source of THC when turned into concentrates, budders and more. Grow Weed Easy is a valuable online tool for understanding most of the basics of how exactly to trim, based on different methods of “wet” and “dry”. Ultimately, with either method, you want to provide a product that looks cared for and worth its price. Portland Marijuana Trimming Jobs: Is This Job for You? Finding Portland marijuana trimming jobs can be a chore. On the one hand, positions can be hard to acquire because Portland is a metropolitan area. On the other, competition for positions that do exist can be fierce, due to massive interest. Trimming is a tedious job, but it’s a skill worth learning. Most entry level workers are paid upward of fifteen dollars per hour, but there is major room for improvement. Entry level Portland marijuana trimming jobs will sometimes pay more than Portland budtender jobs or other entry level jobs like dispensary reception, since trimming can be tedious. Some of the best, most experienced trimmers are able to perfectly trim such a high volume of bud per hour that they are healthily compensated for their work. It is not unheard of for elite trimmers to make very comfortable salaries, since they are such an asset to growing operations. Because it takes some time to teach new trimmers the craft and bring them up to speed, some farm owners will happily pay experienced workers competitive wages in order to keep up with demand and ultimately increase company profit. Most trimming work is found on or around large marijuana farms throughout California and in Parts of Southern Oregon. With changing legislation, however, more opportunities for citywide Portland marijuana trimming jobs may become increasingly available. As I mentioned above, trimming is not a glamorous job. It’s one that involves consistently standing or sitting, doing repetitive work for many hours at a time. If you are someone who doesn’t like to be stationary for long periods, or you think you’ll find yourself too bored with the tedious work, it may not be the job for you. Other positions in budtending or reception that involve customer service, cleaning and using POS systems might suit some personalities better. Even though the task may be tedious, trimmers are expected to be quick and precise in their work. After preliminary training, your supervisor may expect that you can work consistently over the entire shift, producing a desired yield. For most dedicated trimmers, after you do it for a while, it because second nature. In this vein, trimming can be a very meditative job for individuals who prefer not to work in customer service, but would rather work independently. This is sort of a no brainer, but it’s definitely an important factor to consider: trimming involves a constant, daily, hands-on relationship with marijuana. While for most cannabis enthusiasts this is somewhat of a dream, for others it can seem like a chore. This is not a position to take on if you think you’ll grow weary of weed if you have to work with it everyday. Trimmers are encouraged or required to wear gloves as resin from the plant will stick to your fingers and hands and is very difficult to get off. Working with the sticky leaves and buds can at times feel too labor intensive for individuals who don’t like working with their hands. Quite possibly the most attractive perk of working a Portland trimming job is receiving free or discounted marijuana. Often times at the end of the day or week, trimmers will be allowed to take home a portion of trim or bud for themselves. This can be such a sweet reward for the timmer, who has spent their day trying to make their buds look perfect. Trimming is an art form in its own right, and there’s nothing more satisfying than smoking an amazing product you helped to prepare! You can’t become a master grower overnight. Trimming is a valid way to earn in and of itself, but it also serves as a great springboard for those looking to advance in the industry. Working a Portland trimming job gets you up close and personal with the plant, which is a fabulous training mechanism. Being around other trimmers and growers, or interacting with marijuana industry professionals help to give your resume some credibility. As the cannabis industry continues to grow, be sure to look out for Portland marijuana trimming jobs as they appear. It pays to continue to do your research to help separate yourself from the applicant pool. Having an in-depth knowledge of what trimming jobs entail will definitely help in getting a position. Talk with your local budtender and see if they’ve ever worked in trimming or have any growing experience. Any specific information you can find will only increase your chances of securing a job!